Sleepy little monkeys everywhere will clap, stomp, shake, and cheer — while chanting this rhythmic, energetic dance song based on a popular playground game. And as they move their heads, hands, hips, and feet — everyone will be bursting with clapping energy — and ready to start a new day! Written by Bill Martin Jr., the author of some of my kids favorite books such as Chicka Chicka Boom Boom and Brown Bear Brown Bear What Do You See? This story of an active little monkey getting ready to start his day with a little exercise. 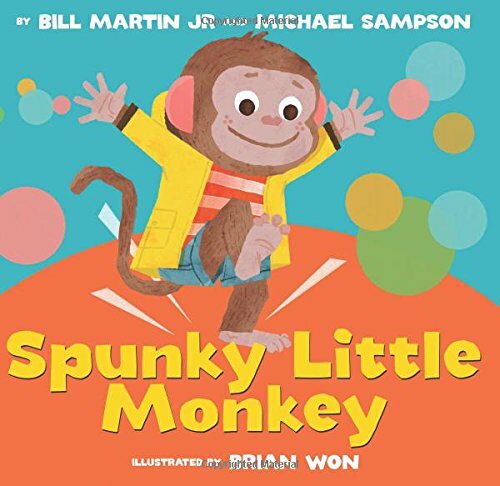 Written in a rhyming, fun, child friendly way monkey teaches teaches us body parts to get little ones moving with a ding-dong, clap, stomp and shake. Kids will love the sing song read, monkey's wide eyes and getting down with monkey.